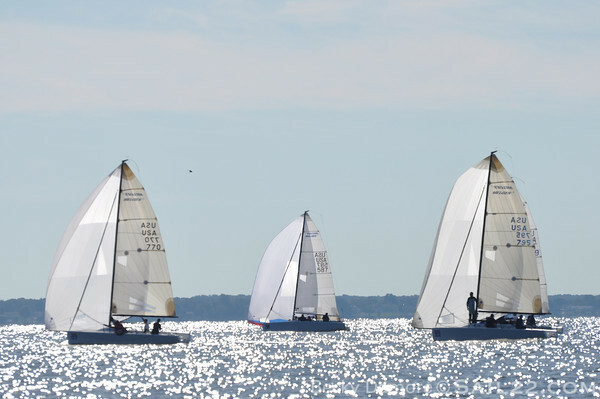 Light air on Sunday provided the Sail22 Melges 24 Worlds Regatta Competitors a glimpse at the full range of breeze they may experience at the Worlds later in October. At the 10am start, the breeze was around 5 knots, but tapered off on the second downwind leg. Uka Uka managed to win race 6 of the regatta, followed by Kristen Lane, Stuart Simpson, Chris Larson and Bill Hardesty. Racing was abandoned for the rest of the day at 1pm and teams headed into shore for awards. Chris Larson's Team West Marine Rigging/New England Ropes was first overall and received a $500 gift certificate from Henri Lloyd and shoes for the entire team from Sebago. Alan Field's WTF was second overall and received shoes for the entire team from Sebago, a vest from Melges Performance Sailing and a shirt from Ullman Sails. Third overall was Bill Hardesty's Ask Vince who received shoes for the entire team from Sebago and a couple of Team McLube t-shirts. Sarah Curran was the lucky winner of a pair of Kaenon Bolsa's after her team on Alan Field's WTF lobbied hard for her to be the very deserving winner. Sarah had broken her sunglasses on Saturday. After the awards teams hung around and enjoyed snacks and Heineken beer. Alec from Velocitek has made a YouTube video of the 5 races on Saturday. To replay the races go to this link. For photos of the event you can go to the Sail22 Photos page. Full results are available here. Sail22 would like to extend a special thanks to Greg Furry, Bill Becker, Andy Okun, Michelle Savage & Mike Floyd from Atlantic Rigging, Rod Jabin from Jabin's Yacht Yard, Jon Forst and Gavin O'Hare for their generosity in helping to make the Sail22 Melges 24 Worlds Tuning Regatta a success. We would also like to thank our wonderful sponsors: Henri Lloyd,Annapolis Sailing School, Velocitek, West System Epoxy, Kaenon Polarized, Rite in the Rain,Heineken,Atlantic Rigging, Sebago, North Sails, Quantum Sails, Ullman Sails, Astral Buoyancy,McLube,WRI Weatherand Sail22gear.com.